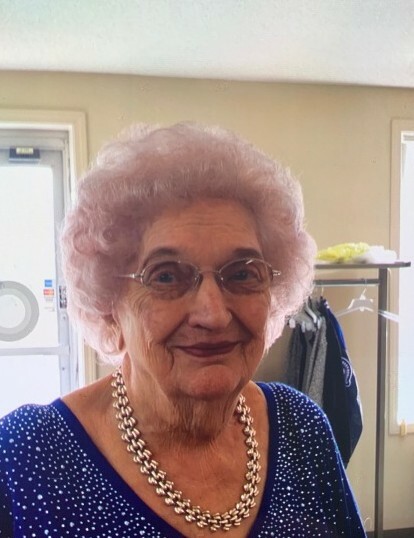 Ellen Calhoun, 91, of Vine Grove, KY passed away Monday, February 11, 2019 at Hardin Memorial Hospital, Elizabethtown, KY.
Mrs. Calhoun was a lifetime member of V.F.W. Post #10281, Vine Grove, KY, and a lifetime member of American Legion Post #113, Elizabethtown, KY.
She was preceded in death by her husband, Frank C. Calhoun; her parents, Thomas Jefferson Newlun & Anna Mae Stanley; and one son in law, George Stephen “Tootall” Trimnel. Survivors include: One daughter, Monika Trimnel of Vine Grove, KY; two grandchildren, Jason Kallenberg & his wife, Kim of Maryville, TN, Shannon Kallenberg of Elizabethtown, KY; four great grandchildren, Brieanna Kallenberg, Ashley Ray, Jenna Kallenberg, and Kylie Perry. Visitation will be from 11:00 AM until 1:00 PM Saturday and at Chism Family Funeral Home, Vine Grove, KY.
Funeral services for Mrs. Calhoun will be held at 1:00 PM, Saturday, February 16, 2019 at the chapel of Chism Family Funeral Home, Vine Vine Grove, KY with Brother Ron Hockman officiating. Burial will follow in the North Hardin Memorial Gardens, Radcliff, KY.